The unexpected news hit the British Public on Boxing Day last year, just one day after excited youngsters and oh so ironic students unwrapped Steps' Greatest Hits album "Gold". The tabloids had a field day with rumours as to just who exactly had instigated the split, but the only thing that could be assured is that the fabulously camp and hugely successful group we to be no more and it's member has gone their own separate ways. Lee Latchford Evans embarked on an acting career treading the boards in the West End musical Grease. Lisa changed directly completely to become her younger siblings boy band 3SL's manager while she currently decides which musical direction to take. Faye Tozer duetted on a single with the Mancunian Opera singer Russell "The Voice" Watson. Which leaves the 2 remaining members, H & Claire, who not only filled the shoes of Ant and Dec as presenters of SMTV (The Tiswas of the New Millennium), but also joined forces to become a pop duo par excellence. 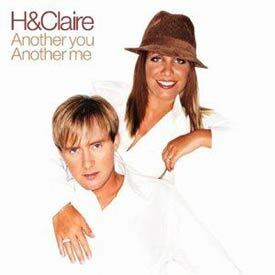 The result of their creative juices have produced their eagerly awaited debut album "Another You Another Me". Musically slightly more mature and a bit edgier than Steps. The backing tracks, arrangements and son structures may sound similar to their previous band, but with better production, sophistication and a touch of class and quality Pete Waterman was incapable of. The biggest change though is that Ian "H" Watkins is given the opportunity to showcase his not inconsiderable vocal abilities, which were unheard of in Steps. Included here are their previous singles - the groovy dance orientated "DJ", "Half A Heart" and the commercial floor filler "All Out Of Love" which was a double A Side alongside their rendition of "Beauty And The Beast". Things come full circle when Benny and Bjorn from Abba pen the albums title track "Another You Another Me" - all orchestral flourishes and emotional depth as you'd expect from the worlds greatest ever pop band. Lyrically were dealing with the universal themes of love, heartbreak and rejection. On "Nothing At All", H comes across as a bargain basement George Michael on this typically upbeat poppy funk fest. Of course the obligatory power ballad isn't far off, but alas the unimaginatively titled "You're A Long Song" is too soppy and sentimental. "No Turning Back From Here" is almost H's solo song, but with Claire joining in on the chorus and is quite pleasant in a semi-acoustic mid-tempo kind of way. The sweet crystal clear voice of Claire is so distinctive on the closing track "Let Me Carry You" that comparisons to the late Karen Carpenter are richly deserved with H's backing vocals providing the icing on the cake. "Another You Another Me" retains the pop sensibility which made Steps so popular, but is richly textured in it's diversity. H & Claire both have an impressive vocal range and whether it be a ballad, disco, pop or dance orientated song they carry it off with the greatest of ease like the true professionals they both undoubtedly are!! !